A Cardboard Problem: Who takes the worst photos? 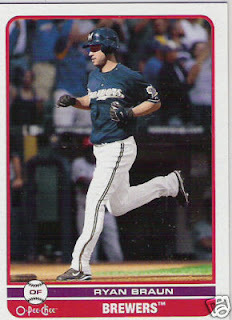 We've probably all agreed that Russ Martin has the best baseball cards. It just seems that the guy can't take a bad photo. However, there's a guy out there who seemingly just can't get a good card. Maybe it's awkward lighting or just bad photographers. 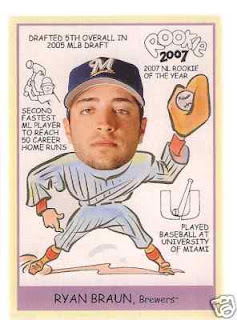 Maybe he just has a weird face, but poor Ryan Braun can't win when it comes to baseball cards. Here's a look at some of his more recent cards. I know there are crazier ones. This is one isn't really his fault. 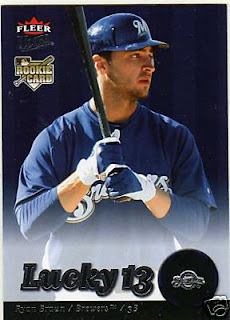 You can't even see his face on this Bowman card. The only way you really know it's him is because of the name on the jersey. But how do we know this isn't JJ Hardy pulling a prank? This one isn't bad. 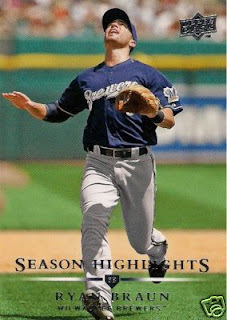 It's a season highlight card showing him running after a pop up. It's not the worst card, but it doesn't show any creativity at all. Oh ... um ... he just looks scary there. That could be an image from an old black and white horror film. Again, this isn't bad, but boring. You really see his face, and I guess that really isn't a bad thing. But his leg looks really weird. It has a weird bend in his calf. Well, apparently, the photographers don't want to show his face. 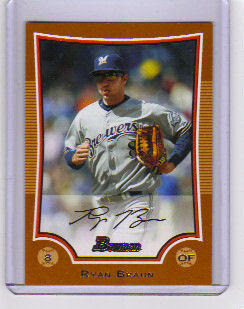 It's probably because of that crazy-eyes card. It's almost like they pulled Braun out of bed for this head shot. 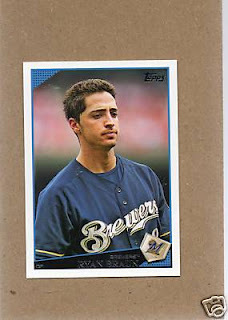 Poor Ryan looks half asleep in half his cards. Good thing you play baseball because life as a model probably wouldn't have worked out. As soon as I saw this post, I thought to myself "she's gotta show the 2009 Topps." Indeed, you came through. 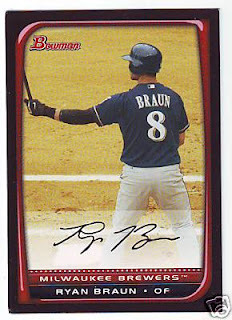 Braun's '09 Topps card isn't a "Worst Card of 2009 Candidate" for nothing. 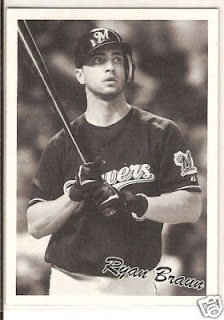 I don't know he looks pretty awake in that black & white Goudey. Makes you kinda wonder what he got into that day, or night. Lol, I would welcome that card.